We discuss the general concept of calculational reasoning within Isabelle/Isar, which provides a framework for high-level natural deduction proofs that may be written in a human-readable fashion. Setting out from a few basic logical concepts of the underlying meta-logical framework of Isabelle, such as higher-order unification and resolution, calculational commands are added to the basic Isar proof language in a flexible and non-intrusive manner. Thus calculational proof style may be combined with the remaining natural deduction proof language in a liberal manner, resulting in many useful proof patterns. 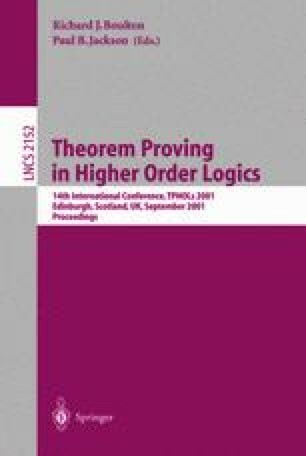 A case-study on formalizing Computational Tree Logic (CTL) in simply-typed set-theory demonstrates common calculational idioms in practice. K. McMillan. Lecture notes on verification of digital and hybrid systems. NATO summer school, http://www-cad.eecs.berkeley.edu/~kenmcmil/tutorial/toc.html. M. Wenzel. The Isabelle/Isar Reference Manual, 2000. Part of the Isabelle distribution, http://isabelle.in.tum.de/doc/isar-ref.pdf. M. Wenzel. Some aspects of Unix file-system security. Isabelle/Isar proof document, http://isabelle.in.tum.de/library/HOL/Unix/document.pdf, 2001. F. Wiedijk. Mizar: An impression. Unpublished paper, 1999. http://www.cs.kun.nl/~freek/mizar/mizarintro.ps.gz.